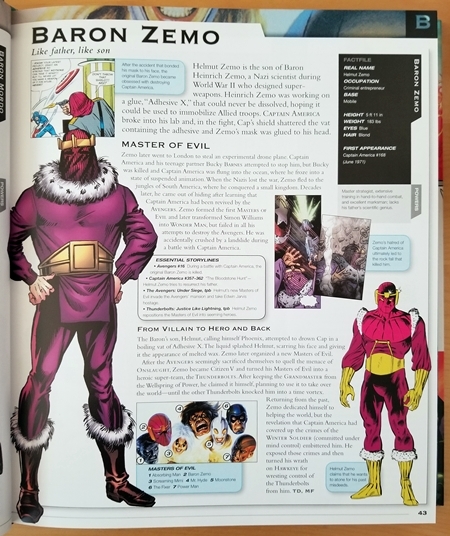 As a kid, I used to spend hours poring over any sort of “superheroes A-Z” content I could find. 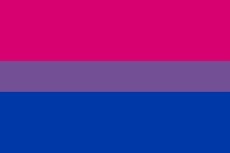 I had some that came in issues of comics, and the long-running Marvel-phile column in Dragon, and probably other sources I’ve forgotten about. When I started playing TSR’s Marvel Super Heroes, I traced hero silhouettes from those articles (Captain Britain was a favorite) and used them as the basis for drawing all of my characters. Fast forward from the late ’80s/early ’90s to now, and I’m kicking myself because it wasn’t until a few days ago that it occurred to me that of course this is still a thing, and it’s probably gotten even easier to acquire big volumes of it. It has! 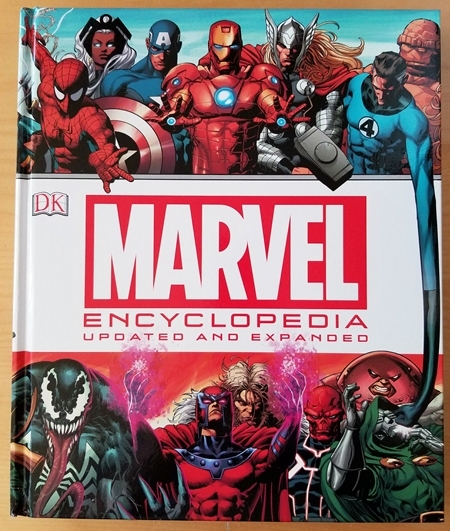 Enter the Marvel Encyclopedia, which — although it’s a bit squirrely about its author credits — is at least partly written by Matt Forbeck, and which is utterly fabulous. This book is titanic. It’s a coffee table book, hardcover, and over 400 pages. Full color, of course. (It had a dust jacket, too, which I find less than useless on books this size.) And it’s $22 shipped with Prime. 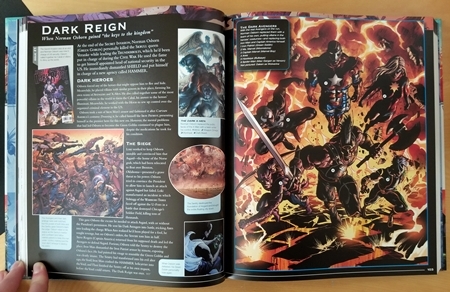 It covers more than 1,200 characters, both heroes and villains, with origins, pictures, background info, and other fun tidbits. It also covers crossover events, famous hero/villain groups, and more. It’s exactly the kind of big, splashy, high-production-values book I’d expect from DK and Marvel. This is the kind of non-gaming RPG sourcebook that I love. Need on-the-spot inspiration for an NPC? Flip through this beast. Stuck for hero ideas for your next character? Lose yourself in over 1,200 of them. Can’t remember who Obscure Hero X is? They’re probably in here. If you did not, there are 26 things you know now. Man, I had the multi-volume loose leaf Marvel Handbooks back from the day, and they were SO BORING. The DK books are exciting and colorful. Now the Who’s Who loose leaf collection. THAT was fun to collect.